I can hear some of my regular friends groaning already "Blue Hydrangeas?" Why on earth is he showing pictures of this most Maritime, most hackneyed and yet most loved Victorian matron. Just as a talking dog, or horse, merits some interest, a front garden planted thickly with Hydrangea macrophylla in Colorado's steppe climate is of more than passing interest. Ever since the "everblooming" sort was introduced a few years ago, I've seen them here and there around Denver. And I have to admit, I'm impressed with how they're doing. This one has a bit of a xeriscape/rock garden in front. Cool! There are too many of these: a giant house in an expensive neighborhood--the street trees are dead and the grass is stressed. Perhaps it's due for a re-landscape? And finally a xeric corner on a Hilltop mansion...notice the bonsai pine? And the red yucca and especially the Cylindropuntia davisii. this is not gardening as usual! I've not been to every big city in America (yet) but I have not found another that grows quite the range--from blue hydrangeas to tree yuccas. I wished I'd photographed the giant rhododendrons I passed by this morning. And there are large evergreen magnolias in a few select gardens. Denver, I love you! You are indeed the city eclectic (or eclecticity for short). If that words not trademarked yet, I better get on the stick. A reflection on art in the garden. Sculpture exhibits have become an important part of the program of many public gardens, especially the one I work at. What I enjoy most about most of these is that they are finite: the very powerful artistic sculptures can dominate the space where they are located. 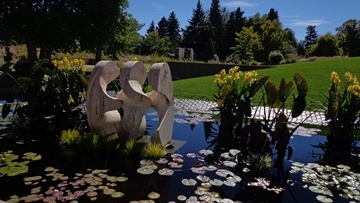 The gardens at Denver Botanic Gardens are sufficiently bold that they hold up well to such art--but if the art were permanent, there is a danger they would eventually become static, or worse, stale. There are many permanent pieces of sculpture on display at Denver Botanic Gardens--all of which I have come to love, this one in particular. I show it first in snow--the minimalist context lets you admire the limestone form without distraction. Imagine how suprised I was to find a twin of our sculpture (not an identical twin I hasten to add) in Europe. I suspect if I had asked, I could have found out who was responsible for this interesting "reflection" of the piece at Denver Botanic Garden which I saw this last May: I was intrigued that the two different artists created somewhat similar forms out of a cylindrical shape. With similarly mottled, sleek forms (this one could be cement: I should have examined it closer). I find it interesting to see how radically different a piece of work can look in different contexts, or different seasons. Garden art is somewhat controversial: but there has been figurative art in garden spaces for as long as humanity has created figures. Figurative art has threbled the visitation to D.B.G. over the last decade not only bringing truly remarkable sums of money, but raising the visitbility and status of the Gardens in the community. Again and again I've been told that new visitors come to see the art, and come back (and join) for the garden. And I think that's terrifc! As we strolled through Lund last Sunday, we walked by the cemetery which was adjacent (as they are wont to be) to the botanical garden where we were not supposed to go (not good enough). It was worth the visit, but this gorgeous piece of art along the way caught my eye, so I photographed it...what a wonderful thing to put on your tombstone! But the phrase that caught me was this little cryptic, haunting quatrain. and summer of the Hellenic coast. Yes. Thanks to my stroll through Lund, and to the internet and (god forbid) Google (and thanks to the enduring enamel of art above all), I seem to have stumbled on someone I'd love to have known. To be honest, I've done this rather ludicrous post for a friend who happens to be doing the horticulture for Denver's Tivoli equivalent. And why not share it with you too? The idea of horticulture at an amusement park isn't everyone's cup of tea: when I shared a few pictures from Tivoli on Facebook, I was met with a little tsunami of...shall we say...dubiousness? I generally find amusement parks in America to be pretty grotesque and crass: two adjectives that I don't think one can fairly apply to Tivoli...but then you be the judge! OK. There was a little grotesquerie and crassness here and there.. I haven't seen many monuments to clowns, but this has to be the best of class in that department...and the green wall behind is pretty cool.. I'm a sucker for Orientalia. I understand using the world "Orient" is tabu [insert accent on "u"] --is Orientalia likewise banned? I have three large Plumbagos rather like this in pots in my garden. Must be the thing to do! I must warn you: there are a lot of pictures in this post. And none of them have been photoshopped ...you see what I snapped. I could drone on and on (and will doubtless chime in from time to time), but really, they're just a lot of flowers of all kinds. Enjoy! Oh yes, and some garden sculptures too! And lots of plants in pots! You'll occasionally catch glimpses of the rides--which mercifully don't dominate the scene as they so often do at amusement parks. The gardens are what dominate the scene! The dahlia time of year..
One must have potted Brugmansias. I do myself. And roses. And elegant barriers to keep you away from the workers who are grooming things for you. I like the dark dahlia and helichrysum together. But as Chris Woods says, I'm easy to please (you can tell he's never lived with me). One can never have enough Tropaeolums in my book. Nor enough ancient olives. Wonder what's destined for the troughs? I wouldn't want to be the one to lug these monstrous Monsteras...demonsterably. And more ducks...these were the most trusting ducks. I walked right next to them and they didn't stir. The Danes are so damn civilized. In America I'm sure they'd be more cautious. Never even went into the Orangerie. I did listen to the jazz band tuning up for a while.. I love this hedge of Cleome. The distant clock tower was so....European! The rides seemed to be designed to admire from a distance as well as terrorize up close. Cacti are so popular they named a bistro (with Mexican food!) after them. And a whole frickin' border on the pond margin! The view from my chair..
She resembles mightily the younger of my two sisters. I miss them both terribly. You can imagine my thoughts through dinner as I looked up and kept jolting in my chair as my re-incarnated sister ate her dinner. I confess, I did have some wine and it did color things up a bit. Things like this are difficult to convey in anything less than nostalgic, heart throbbing verse (which I don't do--very often anyway). I should have that night. ANOTHER performance in the Pavilion...I watched the whole thing.